Editor's note: This piece was published yesterday in Fieldnotes Magazine, a publication of the Max De Pree Center for Leadership at Fuller Theological Seminary. Reprinted by kind permission. The Nelson Mandela portrayed by Idris Elba in the movie being released this weekend is no Jesus. Mandela as he is portrayed in this movie loses his first marriage mostly to philandering, although his political activism comes a close second as a cause because of the time it demands of him, away from his marriage and family. He is a flawed man, and a man who is fully aware of his own flaws—not a sinless messiah. 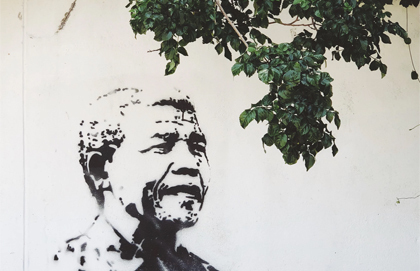 And yet, while he is no Jesus, Mandela is, in one significant way, like Jesus: the leadership he provides results in profound personal loss to himself. Remembering the grand scale of Mandela’s life and his historical contribution, I was surprised by how intimate this movie was, and how much it told the story through the lens of Mandela’s personal experience. Mandela is moved early in his career (by the brutal and unpunished murder of a friend by the South African police) to subordinate his youthful ambition to be rich and prominent to a greater ambition of securing justice and freedom for all South Africans, under the rule of law. His first marriage suffers, and he enters into a second marriage with Winnie Madikizela. His activism requires much time away from his children, and eventually, when he is imprisoned with a life sentence in the early 1960s, he loses his eldest son to an automobile accident, and does not see his daughters again until they are in their late teens and allowed to visit him in prison. The best literature on leadership honestly addresses the responsibility of leaders to help those whom they lead to accept the losses that come with change for the sake of greater gains. Rarely, though, is it recognized just how much leaders themselves must be willing to lose to bring about the change to which they are committed. And judging by the life of someone like Nelson Mandela, the greater the change involved, the larger the scale on which the change is pursued, the higher the cost to the leader. Early in the movie Mandela tells someone else about a recurring dream in which he finds himself back in his house in the township of Orlando, with all the people whom he loves happily gathered together—but they cannot see him. Towards the end he recounts a very similar dream—but now the house is empty, with none of his loved ones to be seen. I have long had great respect and admiration for Nelson Mandela as a leader. As a South African who was, in a small way, active in the movement against racist exploitation and oppression in apartheid South Africa, I have long had great respect and admiration for Nelson Mandela as a leader. When this movie portrayed the events of those years through which I lived myself—particularly from the mid-1980s to the mid-1990s—I was profoundly moved. But what I had never considered in all the years since I first learned who Mandela was, what he accomplished, and what he represented, was the enormous personal cost at which he did the work of leadership. A cost similar to that which all leaders, to some degree, must bear.